Black Ceramic Coated, Holley EFI 2x4 Dual Plane Intake Manifold. All GM LS Gen III or Gen IV engines equipped with LS3/L92 style rectangular port cylinder heads. The LS engine architecture does not utilize an intake mounted water neck or distributor. NOTE: The EFI versions of the LS HI-Ram intake manifold and fuel rail are designed to accept Bosch Style EV-1 or Magneti Marelli Pico fuel injectors. OE LS fuel injectors may not fit properly in the Hi-Ram EFI intake manifold fuel rail assembly. There is a kit available separately for the LS7 Hi-Ram EFI to allow the use of stock LS7 fuel injectors, P/N 300-230 (see below in the service parts section). 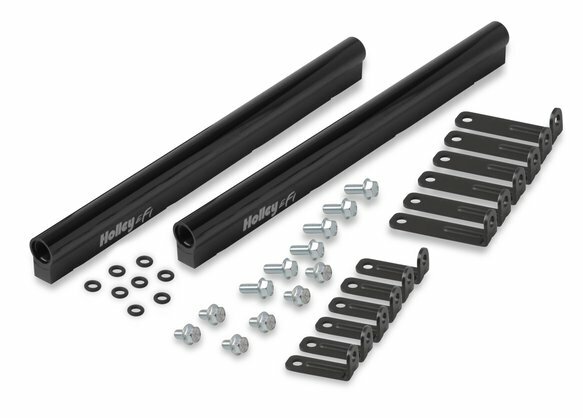 The Holley GM 2x4 dual plane manifold is designed in the tradition of the great dual Holley 4160 induction systems that competed on drag strips, in Trans-Am at Lemans in the 1960's. The technology of the LS pushrod engine is now mated with the impressive multi-carb looks and performance of the muscle car era! 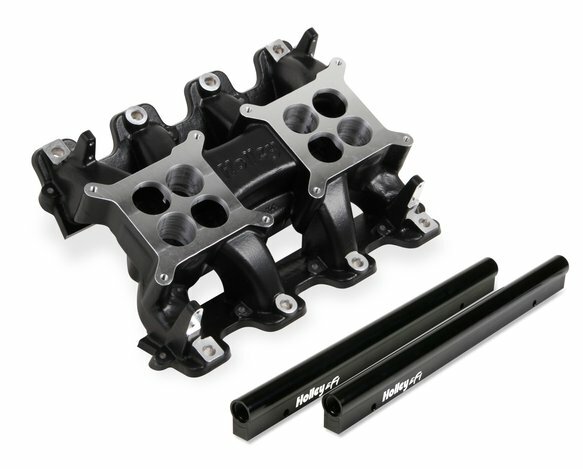 Fits all GM LS Gen III or Gen IV engines equipped with LS3/L92 style rectangular port cylinder heads.